As we experience the coldest month of the year, nothing quite beats curling up on the sofa in front of a roaring log fire. Well, for me anyway. And let’s face it, it’s a fashionable and cosy alternative to coal. It’s also carbon neutral, so long as the trees it burns are replenished. But, wood burning fires have a dirty secret: not only does burning wood release invisible particulates into the air that are as bad for us as traffic fumes, it’s a very inefficient way to heat our homes. After a series of air pollution alerts in the capital within a short period of time, the London Mayor caused a storm when he announced plans to ban open fires and put restrictions on wood-burning stoves. These limits have yet to be set, but should you be weighing up your options, it would be a good idea to seek out stoves which are Ecodesign Ready, the European-wide programme to lower emissions, due to come into force in the UK in 2022. 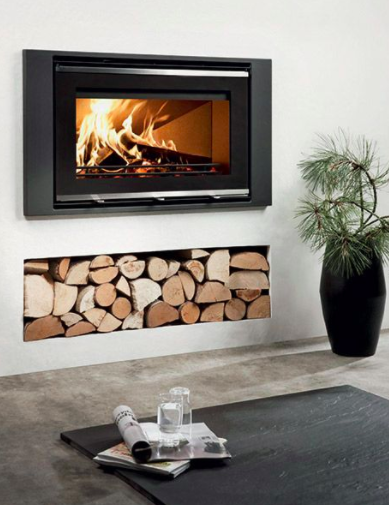 If an open fire is the equivalent of a diesel car, an Ecodesign Ready stove is similar to a hybrid car – the fire box is designed to be very hot, in order to burn far fewer particulates away than open fires. For those who are particularly environmentally friendly, you could consider the gas or electric route. When it comes to fireplace efficiency, gas trumps wood, it burns more cleanly and produces 99 per cent fewer emissions. But, if you’re wedded to the aesthetic and the aromas of a real wood fire or you find the flame of an electric fire a little too fake, there are efficient gas fires available that appear to burn with wood. From opulent to understated, you’ll find a design which will become a statement feature in your home and one which will be seen as a piece of art.